ICIRR CEO Lawrence Benito, right, called Tuesday for an extension of a program that would help prevent some deportations. Chicago activists urged undocumented immigrants not to open their doors following a weekend of raids by U.S. Immigration and Customs Enforcement. On Monday, Department of Homeland Security secretary Jeh C. Johnson announced that more than 120 undocumented immigrants had been arrested during a barrage of raids in Texas, Georgia, and North Carolina aimed at adults who had entered the country illegally. The department plans to expand the raids to other states. Outcry immediately followed—immigrant-rights groups called the operation inhumane because the campaign targeted Central American families fleeing violence in their home countries. 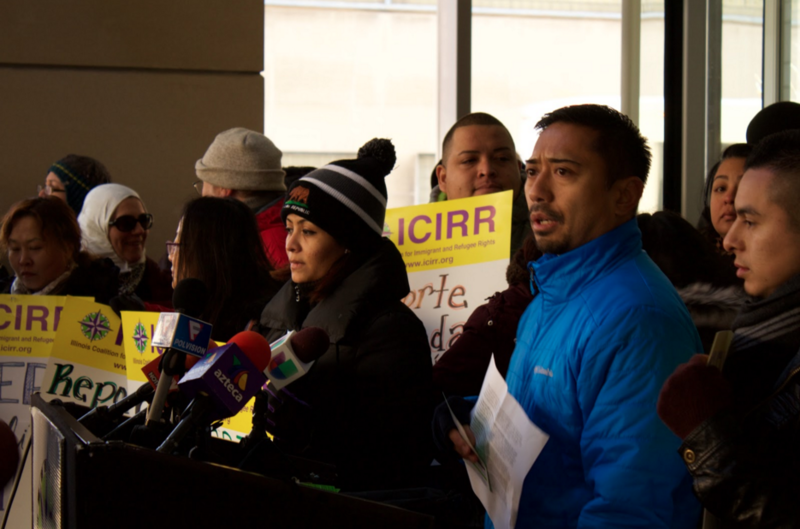 The Chicago-based Illinois Coalition for Immigrant and Refugee Rights (ICIRR) gathered a small crowd of 30 or so opponents outside ICE's Chicago offices at 101 W. Congress Tuesday. They stood in the bitter cold, chanting "Not one more!" Francisco, an Albany Park resident who identified himself by his first name only, described how his house was previously raided. "My home was entered by three U.S. marshals and one immigration agent," he said. After running Francisco's fingerprints, the agents saw he had prior deportation orders and detained him immediately. "My recommendation [to people] who are facing this kind of threat is to not open the door!" Dina Alvallero, a recent immigrant from El Salvador who said she does not risk deportation, painted a dismal portrait of her home country. "When young people don't want to join a gang they are kidnapped or they are hurt," Alvallero said. She said families are fleeing out of necessity, seeking refuge. El Salvador, with a population of six million, suffered more than 6,600 homicides in 2015, according to La Prensa Grafica, an El Salvadoran newspaper. "I'm fearful that ICE is sending [undocumented immigrants] back to their graveyard," said supporter Alex Criollo, 25. "They are trying to get away from persecution, and seeking a better life." Criollo said he is focusing on bringing awareness to undocumented immigrants through social media, in order to help teach people their rights. ICE's roundup of Central American migrants zeroed in on people who have crossed the border illegally since May 2014 and haven't complied with previous deportation orders. In that time the United States has seen an influx of women and children coming from El Salvador, Guatemala, and Honduras. "Really anybody who has arrived in the last two years from Central America is vulnerable," said Fred Tsao, senior policy counsel at ICIRR. "There is a lot of uncertainty with what ICE is going to do." ICIRR also urged undocumented immigrants not to open their doors to anyone they don't know, and to learn their rights. Tsao stressed that, should ICE agents present a warrant, immigrants can invoke their constitutional right to remain silent. Government officials, meanwhile, urged immigrants not to come to the U.S. without papers in the first place. "Attempting the journey to unlawfully enter the United States—alone or by paying ruthless human smuggling organizations—is dangerous, costly and may ultimately prove fruitless," a DHS official said in a statement. Johnson's press release noted that the U.S. border is "not open to illegal migration" and added that DHS will send any undocumented immigrant "back." The DHS official added that the entire federal government is part of an ongoing effort to secure the border, and that DHS is working proactively with government officials from El Salvador, Guatemala, and Honduras for a more sustainable solution that addresses the conditions forcing people to leave their home countries. The Democratic presidential candidate told a group of Chicago’s Latino activists he’d use presidential powers to override Congress’s unwillingness to act.